The eternal flame of shining silver and three clear CZ stones, give the Loretta pendant its whimsical appeal. 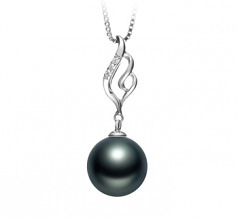 The 10-11mm Tahitian black pearl mesmerizes the senses and brings a touch of romantic fun to all your outfits. 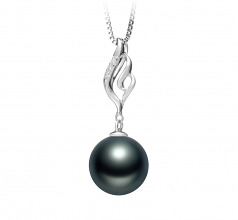 The pendant has classy, bold features that complement any neckline and goes from casual to romantic with flair. The Loretta pendant displays its winning style when pairing it with a dainty style chain. Make Loretta long or short by varying the length of the neck chain. Add a longer, 17.5 inch chain for a great accessory with turtlenecks or high-necked dresses and blouses. 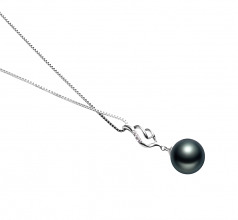 Go with a shorter 17.5-inch chain, and you have the perfect necklace for the round, V-neck, or scoop neck styles. 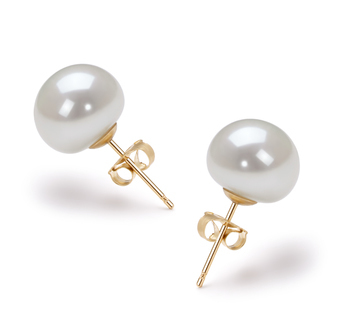 No matter what you pair it with, you have a timeless treasure for any outfit. Show only for "Loretta Pendant"